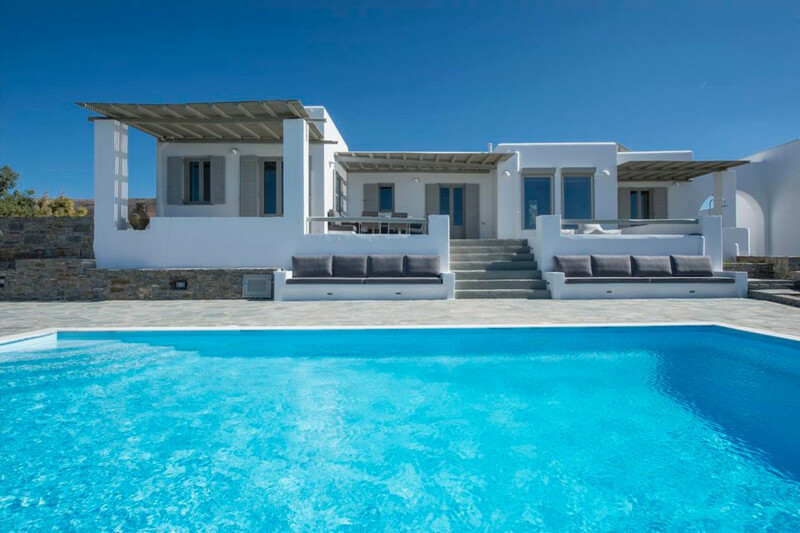 Ganas 1is a luxury Paros villa only 1.1 km from the beautiful Delfini beach on the west of the island and is part of a small complex, consisting of three independent villas. The villa can sleep 6 guests, but if you come with a bigger group you can rent all three villas! The breathtaking panoramic view of the Aegean Sea is only one of the reasons that makes the villa the perfect choice for a wonderful holiday on Paros. The interior spaces are modern and comfortable but the outside areas truly rock, especially if you are fan of infinity pools! Plunge into the pool, stroll in the extensive gardens and terrace or sit at the large patio and enjoy the view! The Cycladic architecture blends with the natural environment and makes the villa the ideal summer refuge. Perfectly located on the top of a hill, just 2.7 km from Paros main town of Parikia, where the summer pulse beats and near to Parasporos beach which is the ideal destination for water sports lovers. You’ll enjoy every moment, trust us! Ground level Spacious outdoor terrace with alfresco dining area for 10 Large living room and dining space for 10 Master bedroom (king size bed) with en-suite bathroom and access to private veranda with sea view Double bedroom with en-suite bathroom and access to a private veranda with sea view Bedroom with 2 single beds (which can be joined) with en-suite bathroom and a view to the outdoor space Hallway with closets, linen closet, washing machine All bedrooms have A/C, flat screen TV, Wi-Fi #Amenities * Infinity swimming pool * Air-condition in all bedrooms * Ceiling fans in living room * Sat -TV, CD/DVD player in living room * Flat screen TVs in all bedrooms * Wi Fi Internet access * Hair Dryer * Washer * Iron & iron board * Safe box * Landscaped areas * Parking #Included Services * Daily “shiny house” mission * Complimentary ride from / to the airport or port * Linen & towel changed: twice a week * Garden refreshment * Pool revitalization THE COMPLEX Villa Ganas 1I belongs to a small private villas complex consisting of 3 semi detached but totally independent villas (Villa Ganas 1, Villa Ganas 2 and Villa Ganas 3). Each villa has its own swimming pool and is surrounded by beautiful landscaped areas with lawn and gardens. Built on 4000 square meters of ground, the compound is designed following the Cycladic architecture and blends harmonically with the natural environment, constituting a refuge where design and relaxation are wonderfully combined. Perfectly located on the top of a hill, just 2.7 km from Town center, where the vivid pulse is beating and near to Parasporos beach which is also the ideal destination for watersports lovers. The 3 stylish Villas are ideal for guests that seek elegance and discretion. All beautifully appointed with contemporary furnishings and modern facilities offering unsurpassed view to the astonishing Cycladic coastline. A unique refuge for families and group of friends that invites you into comfort in fantastic natural scenery!